The Samsung Galaxy S4 mini comes with a number of advanced features and apps that are exclusive to the S4 lineup for now, but will eventually trickle down to older devices via updates. One of the coolest apps is called Group Play. It shares various multimedia across multiple devices in the same room but unlike DLNA it's interactive. One use case is to play a music track on the Samsung Galaxy S4 mini and use multiple phones as speakers. You can pick the role of each phone (e.g. left channel, right, all the way up to surround sound). This way you can control the music from one phone but use the loudspeakers of all. Of course, the other phones will need to support Group Play - the phones communicate over Wi-Fi (your Galaxy S4 mini becomes a hotspot that others connect to) and the pairing is done via NFC. More useful are the options to share a picture or a document - you can have the same picture appear on everyone's phone and you can draw over it if you need to highlight something in the image. S Voice has all the features we're already familiar with, but also comes with a car mode that simplifies the interface and makes text bigger. S Voice can be used to initiate a call, dictate text, play music, open an app, change a setting, make a memo (including voice memo), add a reminder, schedule an event, set an alarm or timer, check the weather, do a search on the internet, look up local listings (e.g. nearby restaurants) and even get an answer to a question. S Voice does duplicate parts of Google Now, but it adds a lot of new functionality Some of these features are available outside of S Voice too, so you can set the Galaxy S4 mini to answer a call or snooze an alarm by voice commands even when S Voice isn't running. The problem with S Voice is that it's still not nearly as fast or as accurate at recognizing your speech input as Google Now. S Translator will help travelers - it can translate between two languages using either typed text or by using speech recognition. It can read out the resulting translation too, if you don't thing your Korean accent can cut it. S Translator supports all the widely-spoken languages - English, Chinese, Spanish, Portuguese, French, German, Italian, Japanese and, of course, Korean. Finally, S Health is Samsung's home-brewed health and fitness tracking application. It starts off by getting you to create a profile which includes all your stats, such as age/weight/gender and level of activity, plus your calorie consumption goals. The app has a pleasant interface and can track your progress, in terms of walking distance, exercise, and fitness, taking into account environmental influences, such as temperature. S Health also supports a number of optional accessories, which enable it to give even more detailed info on your status. We think it's quite likely for more S Apps to made it to the retail Galaxy S4 mini such as S-Link, Photo Reader and even the Cento OnTV remote app that works with IR blaster. 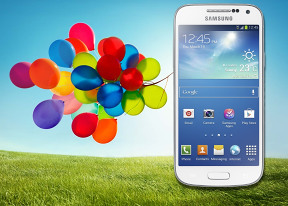 The Samsung Galaxy S4 mini can have better hopes of success than its predecessor. Coming in the wake of one of the best phones in the market, the S4 mini is sure to benefit from the most aggressive marketing campaign Samsung has had so far. Not only does it look like the flagship but has many of its premium features, like air gestures and smart screen. It could’ve done a lot worse than a qHD AMOLED display too. It seems it was important to Samsung to do better than it did last year with the Galaxy S III mini. The hardware had to take a hit of course, but the Krait cores are doing a fine job, while the qHD screen is a lot easier on the chipset and battery while having enough resolution for pleasant viewing. There will be some 720p competitors to consider for sure but WVGA is still the most likely resolution in the segment. So, the Galaxy S4 mini is probably on the right lines. Good enough screen, a rich software package, and friendly size are the right things to keep it spirits high. It’s up to Samsung to take care of the other side of the equation too – the price.